Fjords is a two-player game from Franz-Benno Delonge (Big City, Dos Rios, Manila, TransAmerica). This light tile-laying/area-control game plays quickly (about 30 minutes), doesn’t tax the brain very much, but still provides moments of angst. 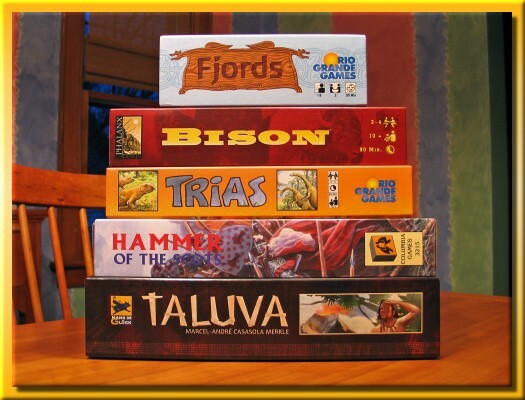 Fjords ships in a small package (5.5″ x 7.5″ x 2.75″) but if you’re pressed for space, the entire game can easily fit in a single Ziploc sandwich bag. 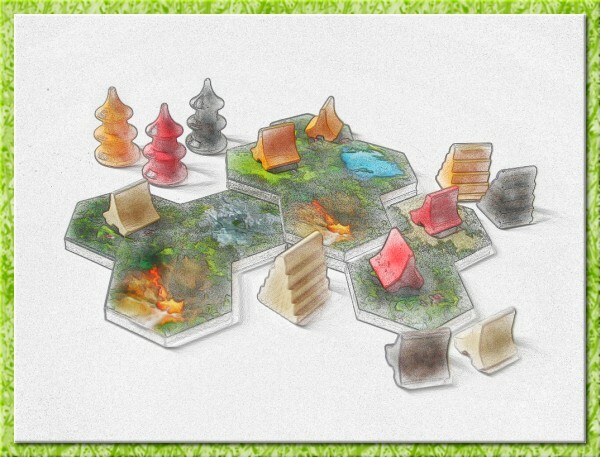 The artwork is very nice depicting three types of terrain (mountain, field, and water) on 40 landscape tiles. 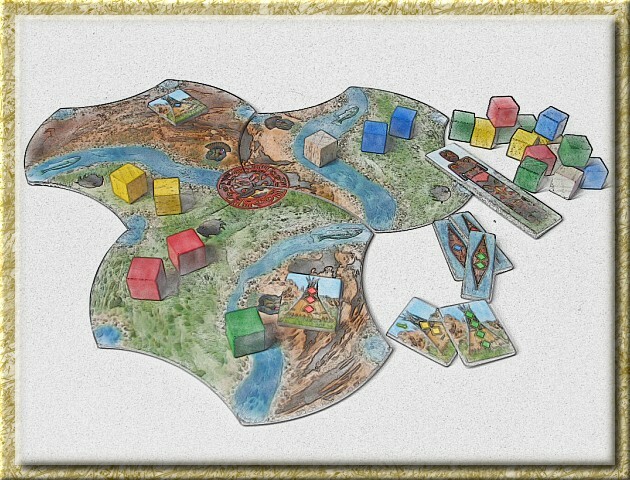 Each player receives four wooden ‘farms’ (houses) and twenty wooden ‘fields’ (discs). The game begins with three specially marked tiles already placed on the board. 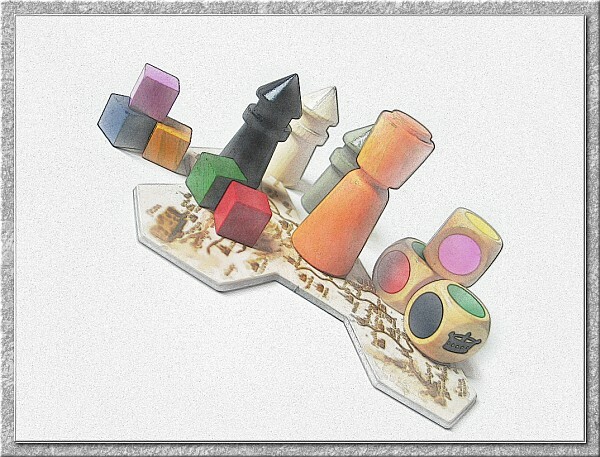 The three tiles depict each of the landscape types increasing the likelihood of drawing a playable tile early in the game. The starting player draws a tile from the pile of face-down tiles and attempts to place the tile. Each tile must touch two other tiles and all terrain types must align exactly. You are also not allowed to place a tile that create an independent land mass unreachable without crossing water. If the tile is unplayable, the tile is placed face up in front of the player and another tile is drawn until a playable tile is found. On subsequent turns you may draw a new tile or discontinuing drawing unplayable tiles in favor of placing a [now] playable tile sitting face up in front of you. After placing a tile, you have the option of placing one of your four farms on the just-placed tile. Play continues until all tiles have been drawn from the draw pile. Remaining unplayed tiles in front of the players are not placed. The player who drew the last playable tile from the draw pile plays second in the second phase of the game. In the second phase, the starting player places a field next to one of his farms (declaring the field as his). The opposing player places a field next to one of his farms (declaring that field as his). Play swiftly proceeds with each player placing fields next to farms or their own previously placed fields. Farms and fields block the expansion of the players fields in an ever-widening attempt to place the most fields. Players must use the rocks and water as ‘pinch-points’ to restrict player expansion. When one player can no longer place fields, the remaining fields are covered by the other player’s fields and your score for the round is the number of fields you were able to place. The second and third game begins just as the first, with only the first three special tiles placed, all other tiles randomized and face down, and each player with their four farms and twenty fields. Sum your points across all three games and the player with the most points wins. Fjords is very easy to teach and quick to play. I enjoy having a game in my arsenal that I can pull out and play only one or two rounds when I only have a short amount of time. Fjords is by no means a deep game. You are at the mercy of the tile draw and in many cases drawn tiles can only be placed in one or two places on the board. Drawing two or three unplayable tiles in a row is not uncommon. Deciding to place a farm is sometimes a crapshoot since you never know if that pinchpoint will get compromised by your opponent or some great spot turns out to be a dead end due to subsequent horrific tile draws. Even though the game does hinge mostly on who goes first in the second half of the game and in the randomness of the tile draws, it does provide a light and enjoyable experience when you aren’t up for something deeper. Fjords is a definite keeper. 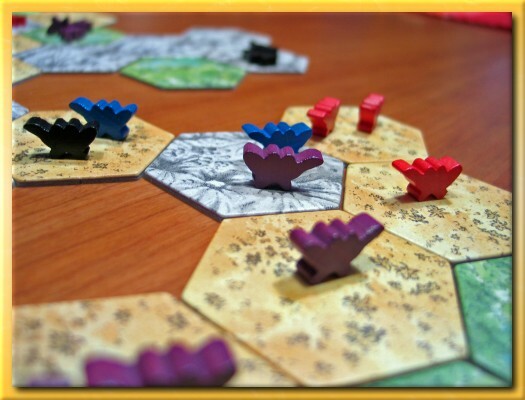 Here’s an interesting article about bringing Catan to the Xbox 360. I think it’s an interesting movement by Microsoft to bring Euro-style games to the ‘live’ gaming community. First off…sorry for the crapcam shot of the game. I only had my cell phone and that’s the best I could do with 1 megapixel. 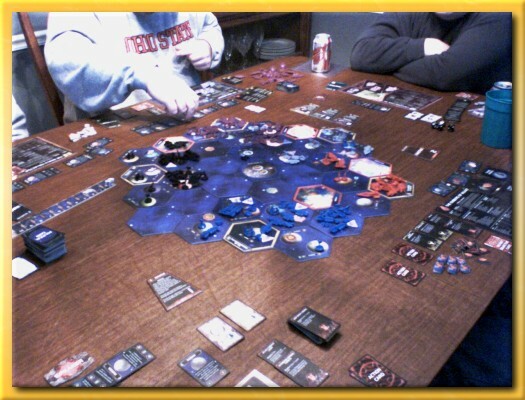 TI3 is an epic empire-building game of interstellar conflict, trade, and struggle for power. Players take the roles of ancient galactic civilizations, each seeking to seize the imperial throne via warfare, diplomacy, and technological progression. With new oversize geomorphic board tiles, finely detailed plastic miniatures, hundreds of cards, and a massive plurality of options, TI3 will arrive before an audience that has been starving for epic space conflict since Twilight Imperium 2nd Edition went out of print in the spring of 2003. Shipping in a massive (12″ x 24″) epic-size box, this new giant-size edition of TI feature more than 200 masterfully sculpted oversize plastic miniatures – the typical TI units (Ground Forces, Cruisers, Dreadnoughts, Carriers, Fighters, PDS, and Space Docks) as well as two new units (the massive War Sun and the Destroyer). TI3 contains new oversize board tiles, more than 400 cards, every known civilization of the Twilight Imperium universe, almost every expansion rule and component ever published for TI, a gorgeous graphical overhaul, and an impressive full-color rules set. Sounds ‘epic’ doesn’t it? Well, epic or not, the game is listed at 240 minutes but we played 4.5 hours and only got 20% of the way to victory. Three of the five players had played before so play was somewhat slowed down by my incessant questions and requests for clarification. However, I’m not really sure that I was slowing things down all that much. As far as I can tell, 4-6 hours for this game is not uncommon. I will say this, although it appears complex, it’s actually fairly simple but I question if it’s worth the time. At first blush it appears that you need to battle others to take over planets to garner control of needed points and votes. However, battling is horribly destructive to both sides and winning appeared to actually mean losing ground to those that haven’t battled. So if you’re not battling, you’re spending your time appearing tough so that nobody will attack. This is not a space battle game. Meanwhile, you amass troops and ships and death stars etc. at a glacial pace while keeping track of that darned technology graph making sure you build out your technology tree to a sufficient depth in case somebody attacks. The whole trading aspect of the game was lost on me as well as the political aspects. The stack of strategy cards eight feet thick was mind numbing. At one point I played a card that let me look through the strategy card deck for one of my choice. The other players moaned and one said, “Okay, now you get to spend the next hour looking through that deck.” Another player threw a sabotage card on me just to keep me from slowing down the game. So, the cold war build up continues while you try to meet your hidden agenda which usually involved taking control of the heavily fortified center planet. Remembering battle cuts deep, if you manage to take control you will most likely become a sitting duck for someone else to run in and blow you away. I decided to try to control wormholes and position an attack through the worm hole into another system where to three neutral planets were sitting ducks. However, by the time I amassed enough troops to be effective, the worm hole exit had become no-mans land between two factions in a face off. If I popped out then, I’d become a Dreadnaught sandwich. So I decided to attack Rich on my right (I was blue in the image above). Rich was very weak after fighting with gray on his right. I built up troops in the tile on the lower right of the board and then Rich goes and plays the “you can’t attack me card” on me two turns in a row. So I was left with moving troops towards black’s weak backside on my left. Black was amassing troops at the worm hole exit positioning himself for the attack on the center planet. In the end, I got whipped by planetary defense systems on the fortified planets. By the time we quit, I was only able to grab one stinking victory point by spending 6 hard earned goods tokens on the exposed community goal card. So in four and half hours I played cold war games with plastic figures and I can’t figure out why? The first hour or more seemed like going through the motions grabbing planets around your home system but I hear there are posted variants that attempt to chop this time off by some sort of quick-play mechanism to get those first few turns out of the way. I’d be up for playing the game again with this variant but not from scratch. Anybody else having any kind and/or harsh words for the game? I’m organizing a weekend (Fri-Sun) “cabin-con” at Lake Hope State Park in a few weeksfor my gaming group and for several people (gamers and non-gamers) I work with. It’s mostly a chance forus to just hang out together in a relaxed environment, away from the hustle andbustle of family, kids, telephone, and television, and to have a chance to kickback with a beer or two and play some games. We’ve done this once before but it was organized as a surprise for my 40thbirthday and we had a blast. That time I didn’t have to organize a thing but this time I’ve got to get my ducks in a row. So, today I started looking through my game shelf trying to decide what games to take. There’s not room for everything, unfortunately, but I have managed to whittle it down to twenty games. Twenty is probably too many but I want to provide a good selection (there will be other games brought by others as well). So, here’s the short list (or long depending on your perspective). Amun-ReOne of my favorites but I’m not sure it will get played due to it’s length and the availability of other games. It plays best with six and we’ll have many more than that so the opportunity is there for a great game but I’ll just have to see how it goes. Bison: Thunder on the PrairieA recently new title that I’ve only played once but enjoyed quite a bit. I performed poorly on my first play so I’ve got a burning desire to redeem myself in another play. Carolus MagnusMy all time favorite three player game. I’ve read on more than one occasion that the third player is an eventual kingmaker which I can understand I suppose. However, I don’t believe it’s any more of an issue than any it is in any other three player game. I view the game as an amazing effort by Leo Colovini. CaylusI must admit that I’ve never played this title and now is my chance. Caylus was, at one time, thought to be the game that would topple Puerto Rico from the top spot at BGG but it’s now 4th after Tigris and Euphrates and Power Grid. For SaleI always like to have a good filler while waiting for another game to break up, waiting for dinner, or just to let the brain relax. FjordsAnother one of my recent titles. I wanted to have a light two-player game in case there ever were a couple of people waiting for another table to break up. I also thought that since there would be a few non-gamers coming to the event, it would be a good idea to offer some simpler games they might want to pick up to play with their families and/or spouses. Hammer of the ScotsAnother recent addition to my collection but I haven’t had a chance to play yet. The weekend is going to be one of my best chances to get this to the table. KretaI’ve tried a few times to get this to the table during our normal gaming events but we either have more than four or something else got played. I’m really going to push to get this one to the table. ManilaA lighter offering that we have played in our normal game nights. I’m pretty sure this will see the table some time during the weekend. MasonsI’ve only played this over lunch at work once and found it engaging enough. It seems like it’s pretty light. So much so that I suspect it will see the table in much the same capacity as For Sale. Power GridThis game is the bane of our group. On two attempts, we’ve never been able to finish a full game. Both games lasted forever due to our slow play and the time ran too late for people to feel like they could get up for work the next day. If we’re ever going to finish a game, well this is the time to do it. RaAnother light game we’ve played in our normal game night. I suspect some of the newer players will like this one as well. Play moves quickly although the scoring can be somewhat confusing at times. Auction games are a little harder for new players to pick up since you’re never really sure what’s worth bidding on and for how much but even when you don’t, this game can be fun to play. Reef EncounterOne of my favorites although I’ve only been able to play a few times. We played once in my normal group and I think most found it moderately interesting. I’d like to play it again with some newer players to explore their reaction. TaluvaA recent title that I’ve enjoyed playing quite a bit. Taluva is quickly rising as one of my favorites but I have a nagging suspicion that it will flame out and drop quickly as the tactics grow old (i.e. Carcassonne). However, for now, I’m enjoying it and want to get it to the table. Thurn & TaxisI like T&T but I’m bringing it mainly for others to play. We’ll have a large contingent of non-gamers willing to see what this boardgaming thing is all about and this game is easy enough to learn that I think they’ll like it. TichuI’ve only ever played this once and frankly, I sucked. The teacher was horrible and everyone else had played before. I felt like I was holding up the game, I felt hesitant to ask too many questions, and I felt bad about my poor plays that everyone felt I was making (e.g. what an idiot!). In any case, I can see the fun in the game and would like to introduce it to the group. The rule set that comes with the game is horrible. It makes the game sound like it’s very complex but it seems like it’s not much more difficult than euchre, rook, or any other common trick taking game. Tigris and EuphratesCan you go to an event like this and not have this in the game cabinet? TriasAnother recent title that I’ve only played as a two player game. The official two-player rules stink to high heaven but the BGG variant where each player plays two colors isn’t half bad. I’d like to get this to the table with four or five real players and see how it goes. We’ve been having a horrible bit of weather the last few days and the kids have had snow days away from school. I’ve been coming home from work early to avoid the traffic and because of that, we’ve had some extra time and I suppose you can guess what’s been filling it. Lisa and I played a two-player game of Taluva on Monday and then this afternoon, we played a four-player game with a couple from down the street. I’m really starting to like this game for more than just its looks. The tiles and the wooden bits are beautiful and by the end of the game the constructed board is stunning. Taluva has an undercurrent of Schadenfreude (take that!) by allowing players to squash other player settlements but sometimes you’ve gotta do what you’ve just gotta do. If you’re aware of the situation, you can go a long way to prevent it from happening. I like the interaction with four players each trying to get off on their own to build vertically but like ants at a picnic, your opponents are not far off and tend to gravitate towards the higher locations of the board at your expense. Sophie and I managed to get in a quick game of Polarity the other night. I’m not much of dexterity game kind of guy but it is kind of fun to play this game once in a while. The after game playing around with the magnets is, at times, as fun as the game itself. Lisa and I got in a game of Fjords. Not much to say here until I do my complete review. I’ve not grow tired of this light two-player game but I do wish that the tile placement locations weren’t quite so constrained. However, opening up more possibilities to tile laying would make it even harder than it already is to protect an area on the board. Noah and I played a two-player game of Trias this evening. Yuck. This game stinks with only two players. I haven’t lost hope that it’s better with more players but I don’t think I’ll play it again with two. The OCD in me kicks in a bit because the tiles get jostled quite a bit during play and the distance a tile is from the south pole is important. After a lot of drift it’s hard to tell what’s possible if you’re not keeping things lined up properly. I think playing the game on a felt mat printed with hexes would be a drastic improvement. The bits are pretty cool looking but those dinos are extremely tiny. More ‘sketching’ one of my photos but this time with Carolus Magnus. I liked how the Taluva image turned out and thought I’d play with an image of Bison. We only had four able to attend last night’s AGN Feb 2007 at my house but that did give us the opportunity to play a four player game later in the evening that we usually can’t accommodate with the normal group. Ken brought his copy of Kahuna and I forced him to teach me the game. Several images of the game have popped up on BGG and I’m always on the lookout for nice two-player games that Lisa and I can play. 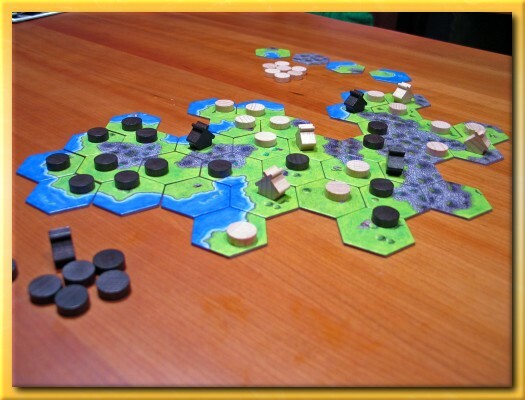 Kahuna fits the bill pretty nicely by wrapping a larger game around three smaller ’rounds’. 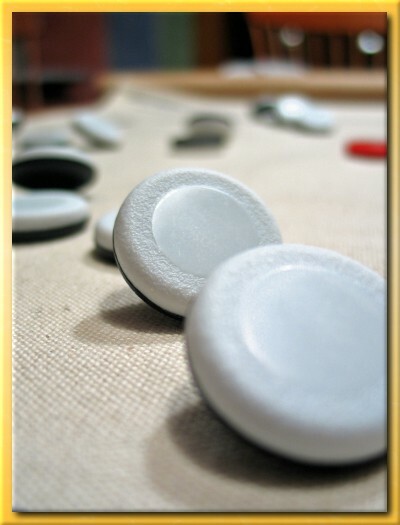 Although the ‘three and done’ flavor is common in two-player games, Kahuna requires you to play all three rounds since the scoring mechanism it slightly different each round and the board layout is retained from one round to the next. I like Kahuna because it gave me the impression that I was stretching some gaming brain muscles that I hadn’t used with other games. The ability to cause a ripple effect across the board when bridges are built on adjacent islands is a nice touch. Since Ken taught me Kahuna, I figured I’d reciprocate and teach him Fjords. It’s another nice two-player game that has the common ‘three and done’ structure but with Fjords, you can easily play only one or two rounds if you’re really pressed for time. The game is composed of three completely independent subgames and the winner is the player with the highest sum across all three subgames but I don’t see why you couldn’t easily play one or two ’rounds’ and call it a day if you wanted to get in a quick game or two over lunch at the office. I’ll be posting a full review of Fjords in the coming weeks so I don’t want to spill all the beans quite yet. The final game of the evening was Bison: Thunder on the Prairie. I had only scanned the rules once the night before and I felt hesitant to play it. I don’t enjoy teaching a game by reading the rules aloud. I would rather learn the game on my own by playing a few sample rounds, consulting BGG for answers to questions etc. but the group seemed genuinely excited to play it so we gave it a go. It took us quite awhile to get through the rules but as usual, within a round or two it was like riding a bicycle. Bison is a simple area influence game with a few quirky mechanics and some unique scoring techniques thrown in but like Fjords. I’ll be giving a full review in a few weeks so I’m hesitant to say much more. However, even after only one game I have to say I was impressed. Bison doesn’t have a lot of novel features but the theme is unique and it has a nice ‘thinky’ feel that warms up the skull quite nicely. My latest shipment arrived today from Game Surplus. 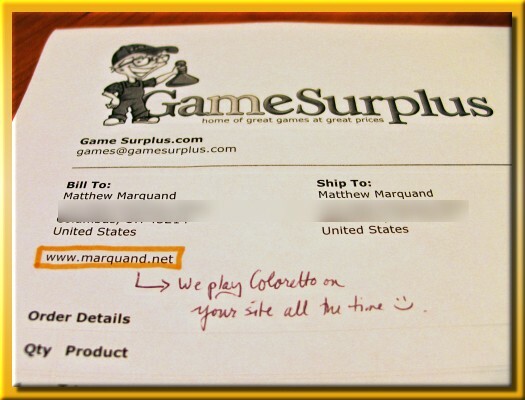 Included in the shipment was the receipt with a nice note written on it too.